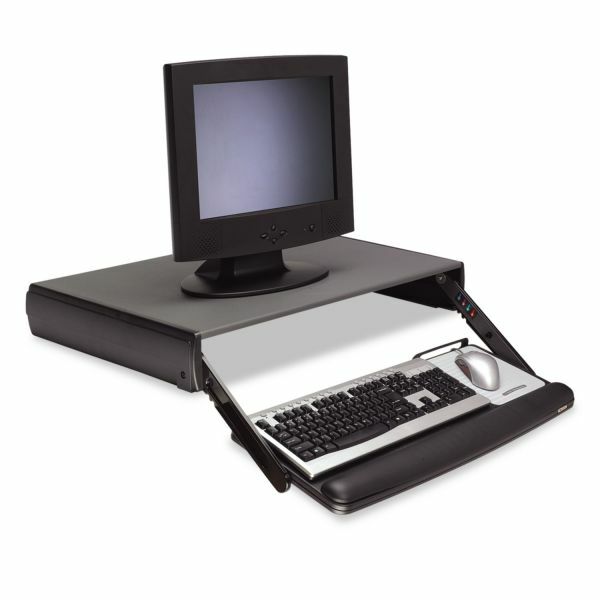 Provides excellent flexibility that works great in laboratories and for mobile workstations. Four distinct height adjustment levels up to 3 3/4" below desk level with adjustable tilt. Wide platform provides a spacious mousing surface next to the keyboard for comfort (right or left). Includes a full length soft leatherette gel wrist rest with antimicrobial product protection. 3M Adjustable Keyboard Drawer, 29 3/10w x 19 4/5d, Black - Adjustable Desktop Keyboard Drawer is designed for use with corner or standard workstations. Requires no underdesk space to use. Low 4" profile for better monitor height. Platform adjusts 3/4", 1-1/2", 2-5/8", and 3-3/4" below work surface. Tilt adjusts positive 30 degrees/negative unlimited degrees. Wide platform places mouse next to keyboard for added comfort. Mousing surface can be used to the left or right of keyboard. Includes full-width wrist rest with antimicrobial gel and Precise Optical Mousing Surface. Keyboard Drawer offers durable steel reinforced construction. APTA endorsed. Accommodates keyboards with a maximum height of 1 1/2". Fits most keyboards and supports up to 80 lbs. or 21" monitor.